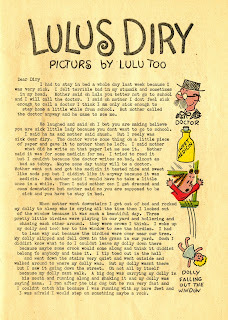 I've meant to discuss the Lulu's Diry text pieces since I started this blog. So let's get it done, what say you? 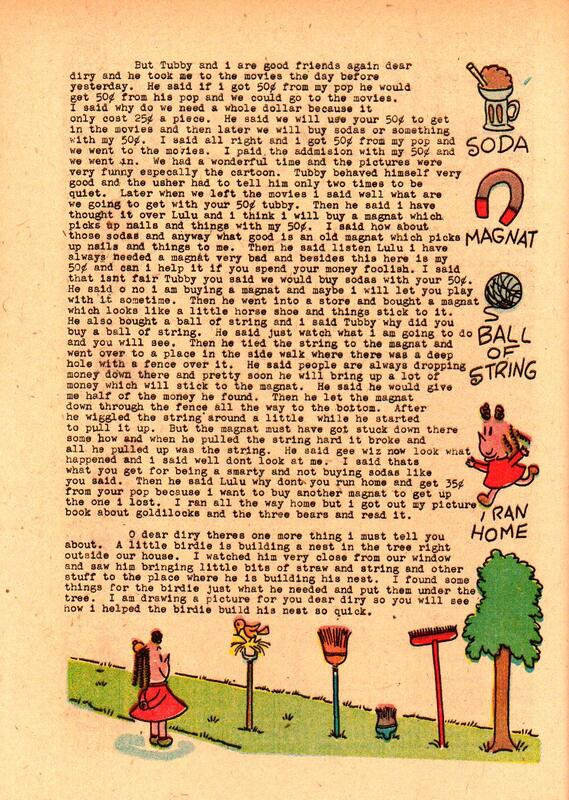 In order to classify for second class postal rates, which made subscriptions economically feasible, series comic books had to have at least two pages of typeset textual matter. 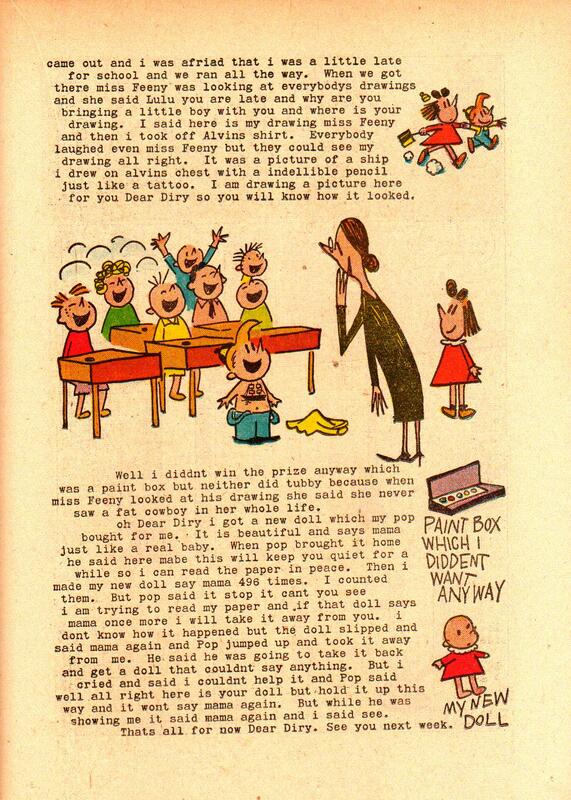 This smacks of disdain to me--an early blow against the comic book as an agent of illiteracy. If comics went through the U. S. Post Office, by God, it wasn't going to be so that morons could drool over their gaudy, tawdry pictures. Never mind that comics stories typically have a fair deal of text, and that the best writers used those words in an intelligent and deliberate way. Comics publishers needed that cheap postage, so they agreed. This gave birth to the letters column, the editor's page, "Stan's Soapbox," et al. Well-meaning assistant editors wrote columns on hobby tips, the history of the camera, the riches of Nigeria. Mickey Spillane, years before his pulp-fiction breakthrough, penned rank adventure tales for Timely's fillers. No one gave a sh!t about these things. They had to be done. Who read them? Who looked forward to them? Even the most entertainment-starved, bored persons might impatiently scan them, attempt to get absorbed in them, and give up around the fourth paragraph. When Marge's Little Lulu was officially launched as a regular series, in late 1947, Western had to comply with this rule. 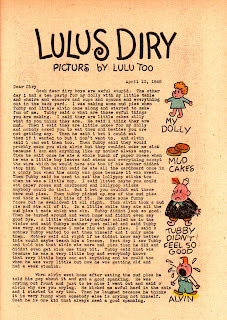 The nine tryout issues of Little Lulu in the Dell "Four Color" series weren't sold by subscription, and thus didn't need the filler. But all of Dell's regular titles had to comply. 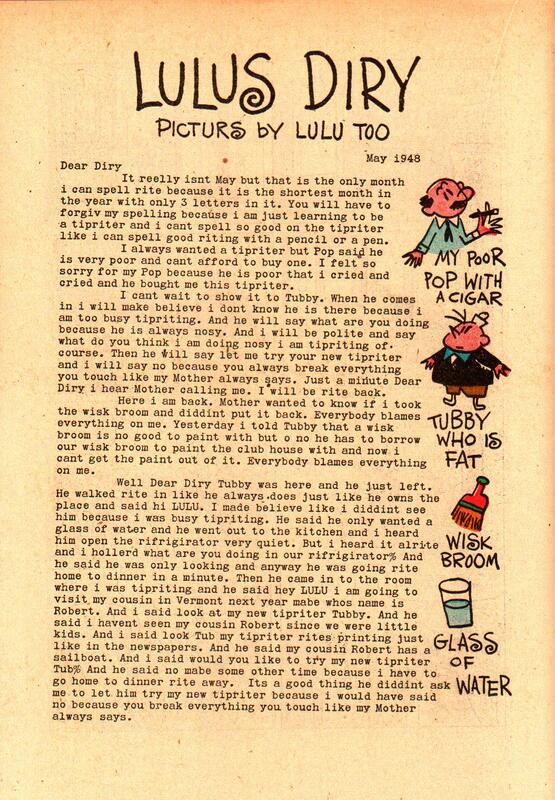 Lulus Diry is a remarkable exception to the cruel rule of funnybook filler. Unlike, oh, 98.9% of all fiction-based comic book text pieces, these were always witty, sometimes surprisingly subtle, and frequently very funny. I have no documentation that John Stanley wrote these. That they (a) line up with his typical Lulu scenarios, (b) are often quite funny and (c) use language in a comical way leads me to this conclusion. 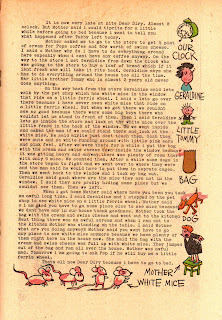 It is clearly Stanley who provided the sorta-kids drawings that grace these two-page installments. The tell-tale spikiness of his vivid line-work can't be mistaken. Here is the first Lulus Diry-- a droll, detailed and low-key first-person account, with just a touch of fourth-wall noodging and a vast array of clever typos and mis-spellings. No other text fillers created as subtle and vital a relationship between words and pictures as did Lulus Diry, from its inception. The illustrations are amusing and inviting. They also serve as a breakdown of what's going on in those badly-typed fields of text. The seemingly arbitrary mix of people and objects supports the text and bolsters its humor. At the time, Western's text fillers tended to be namby-pamby, at best. 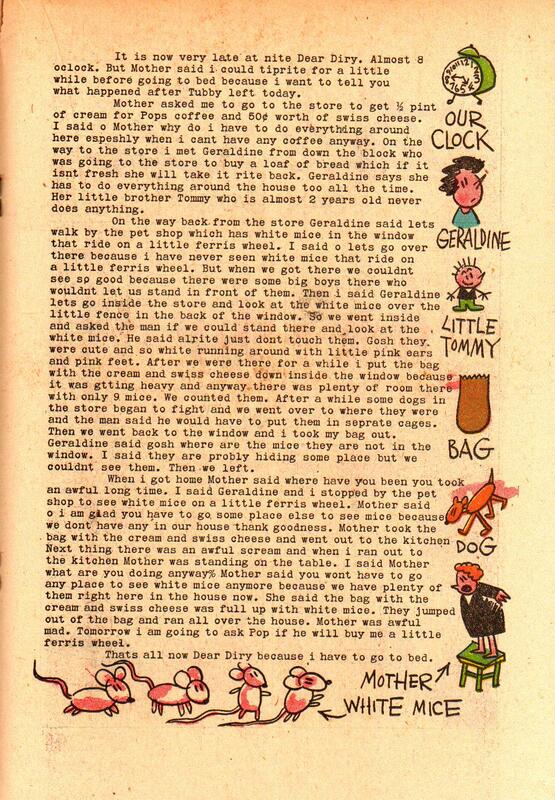 In comics such as Our Gang and Raggedy Ann and Andy, these pieces were considerably longer. 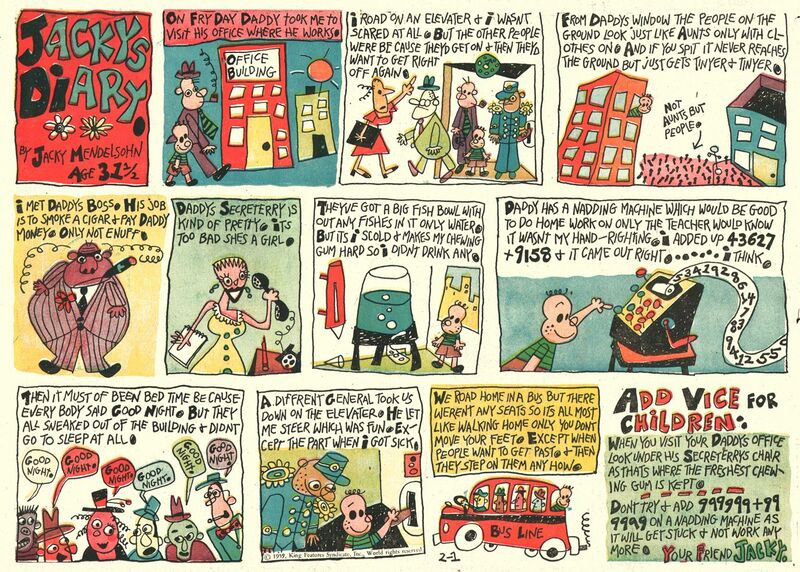 Oskar Lebeck and others at Western may have been concerned about parents' disapproval of comic books, and made sure there was enough typeset material to give them legitimacy. Lulus Diry offered Stanley a way to get to know his main character better. 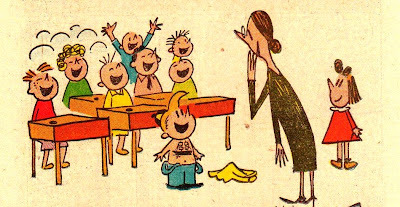 By writing from her point of view, Stanley slowly increased Lulu's humanity, and changed her from the acerbic imp of Marge Buell's magazine cartoons to the complex, distinct individual she was by 1950. I don't think this was Stanley's plan with these pieces. That he, and Lebeck, sought for a creative alternative--i.e., to make these Dirys something readers might actually look forward to reading--was impressive enough. That Lulu's personality emerges from this prose is a remarkable perk. Diry Too is particularly funny. 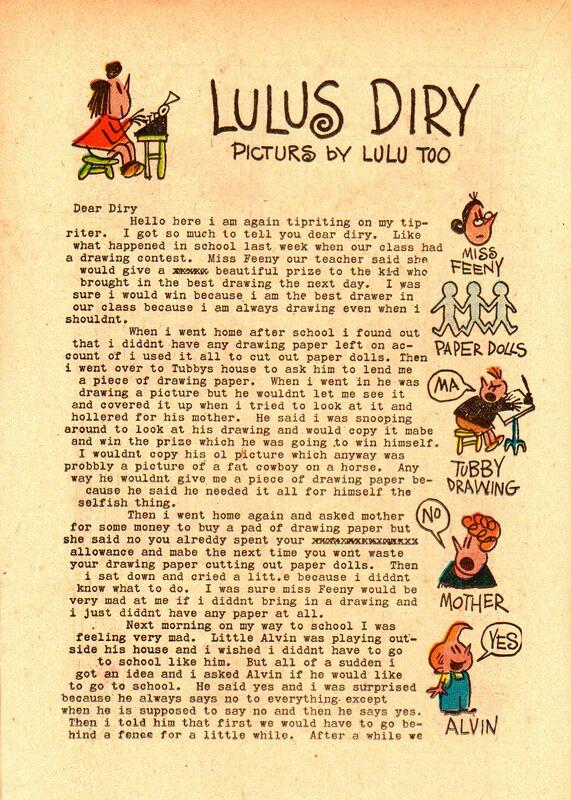 Lulu's typos and mis-spellings inform the humor of the two segments. 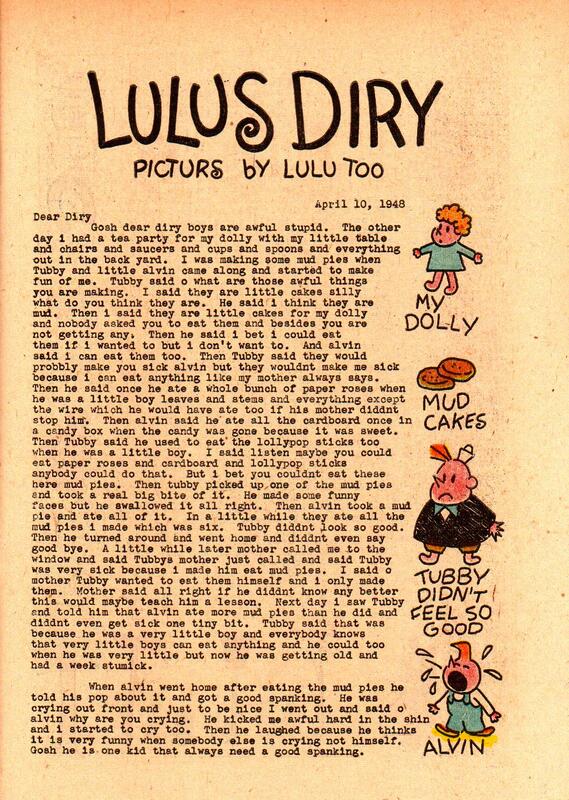 Part one reads like a typical early "Lulu" comics story, only with the delightful addition of Lulu's fractured prose, and her surprisingly opinionated look at the world around her. The illustrations add value to the humor of the prose. Note the "Paint Box Which I Diddent Want Any Way"--a beautiful garnish to the first segment's finale. 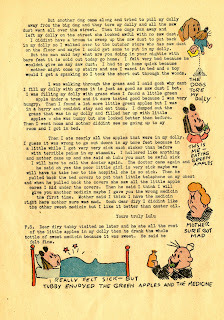 In the second segment, Lulu's recalling of the exact number of times her doll said "Mama" is laugh-out-loud funny. It's this specificity that makes Stanley's best work so enjoyable and rich. By Diry Three, the accompanying drawings, which include icons of childhood, and of the Lulu landscape, correlate more directly to the amusing text. It's fascinating to see the process of this feature get tweaked with each new installment. The use of run-on sentences, and an artful lack of punctuation, makes the laff-value strong throughout this installment. 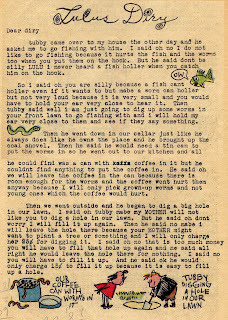 The first bit, about the mud cakes, again reads like a classic Lulu comics story. 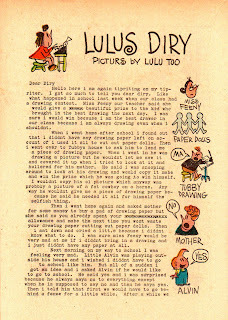 Tubby's egotism and Alvin's obliviousness, seen through the lens of Lulu's persona, are practically drawn with words. The pauses in the action also suggest how Stanley might have broken the story down into panels and pages. The second bit digs deeper into the self-centered psyche of Tubby Tompkins, and earns more laughs by the assiduous mis-spelling of magnat. The brief third bit offers a genuinely sweet moment amidst all the comedic chaos. The fourth installment went for less kid-like drawings. Note, too, that the typos are soft-pedaled. Mis-spellings and malapropisms still enliven the text, but the X'ed out words, keyboard blunders, and other more childlike touches are gone. The drawings are quite close to the other artwork in this issue. The neater, trimmer affect doesn't dim the charm of this long single story. 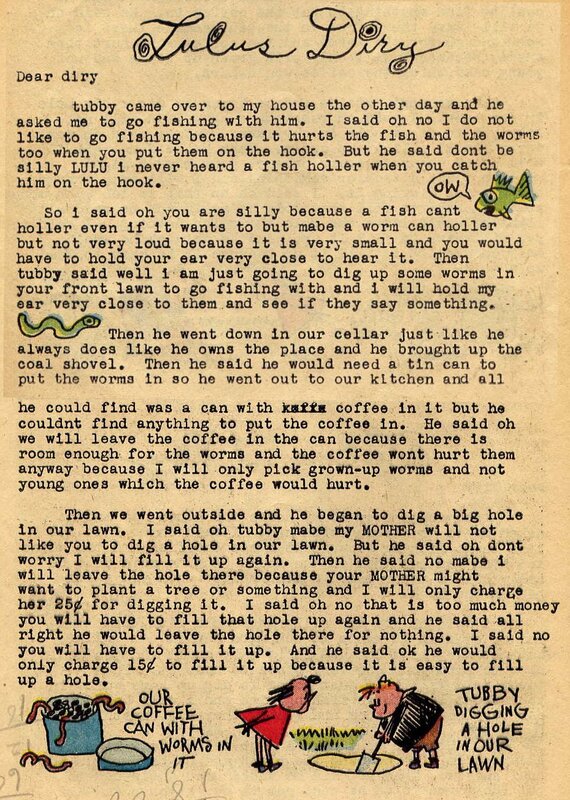 The real-ness of this Diry's contents, their leisurely presentation, and the small details that only a child would notice endow this installment with a subtle humor that reserves its belly-laugh moments for the second page. 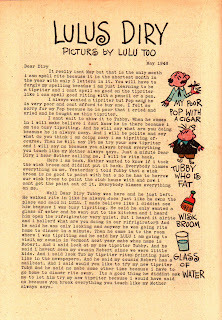 The butcher's comments to Lulu, and Tubby's actions during his visit to Lulu's sickbed, are delightfully funny. "He drank the whole bottle of sweet medicin because it was sweet." The fifth Diry was printed on the bottom halves of four consecutive pages, with the comics story "The Burglary" on the upper berth. I've reformatted the text into its typical two-page spread. Note that the sloppy drawing style and Xed out words are back. The drawings are now even more scrawly and kid-like. They're not quite Jacky's Diary, but they're considerably cruder than what came before. This firth Diry is less focused than its predecessors, but no less amusing. Tubby leaves a wide swath of destruction, each action 101% justified in his mind. Lulu's reluctant participation (for which she accepts no culpability) is made funnier by her telling of the event. A rigged marbles match, in which Lulu spins the ol' karma wheel, and wins, ends this installment. Lulus Diry outlasted Stanley's tenure on the book. Its innovations were soon thinned out. With the tenth installment, the mis-spellings and X'ings out were no longer part of the format. 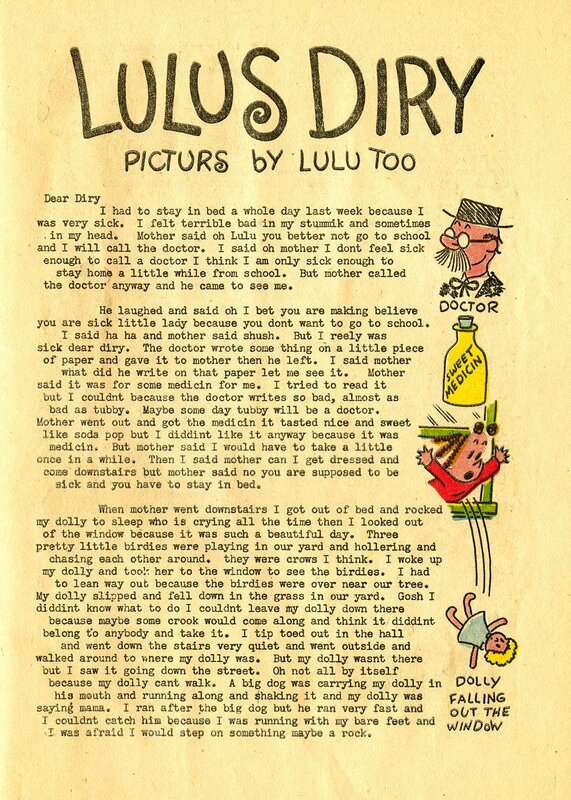 Lulu's lack of punctuation, and her malapropisms, remained, but were gradually toned down in the mid-1950s. 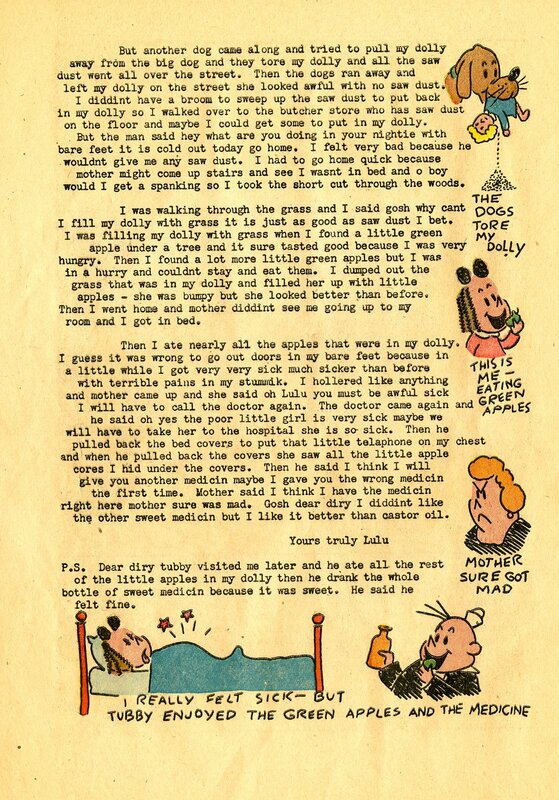 In this period, the font size changed to a non-typewriter style, and got larger, as did the illustrations. While the Diry was still amusing, it was simpler, and had less content than these early installments. 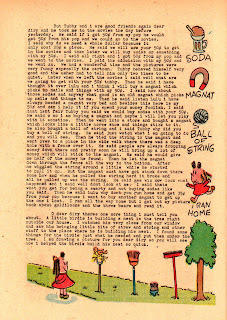 With issue 82 (April 1955), the feature shrank to one page. At this point, the Diry becomes perfunctory. I think Stanley had burned himself out on this segment--or handed it over to another author. 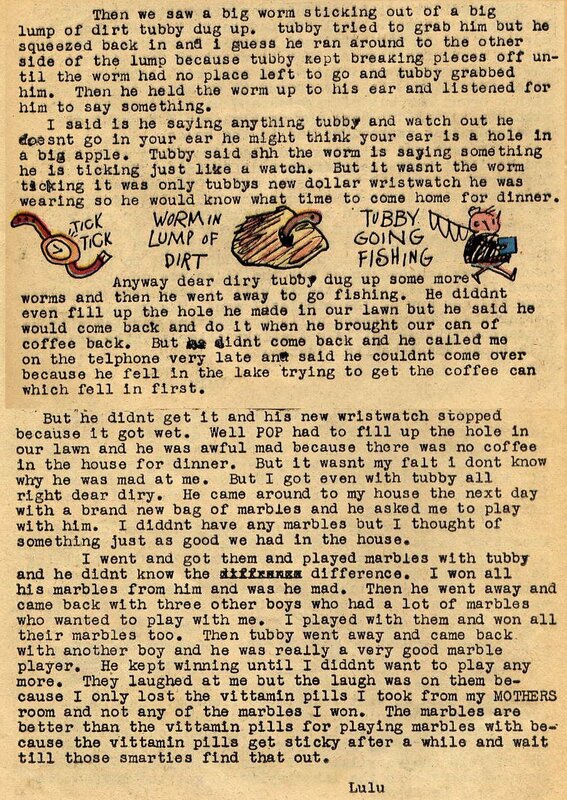 As you've seen, the early Lulus Dirys are detailed, funny, and show Stanley's persuasive skills as a prose writer. 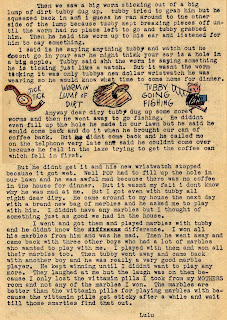 Stanley wrote other text pieces, including those for the Dunc 'n Loo series. Because of their cohesion to, and enhancement of, the characters and their world, Stanley's Lulus Diry, in its early installments, is major work that has, because of its humble species, been overlooked by many. Interesting info about the text requirements for comics. 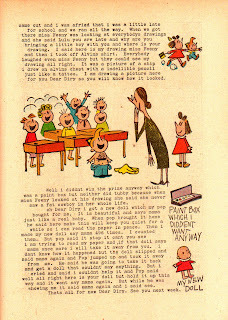 As a kid in the '50s, I always read the Dirys as a matter of course but had not seen any of these early examples before. Thanks for the post. These are wonderful. A totally different kind of storytelling that Stanley pulled off so well.